August 29, 2017 | -by: Kevin George. Email marketers start preparing for their holiday email marketing campaigns way in advance. But then there are always some procrastinators who at the last moment have to reuse the previous year’s holiday email templates! Are you one of them who had almost forgotten about Columbus Day? Well, the Monks are here to help one and all- the organized ones as well as the procrastinators. The hero image has the message imbued and the alt text of image also conveys the same. Subject line – “Columbus Says: Sale Home” – goes with the theme. The CTA is neatly tucked below the hero image. There’s a referral bonus on inviting a friend. A pre-header has been provided. A bold headline announces the sale. Neatly stacked sections with witty titles and individual CTA buttons. But an interactive element like a Slider or Menu would have helped to reduce the overall length of the email. • Simple yet quite effective. • To create the sense of clock ticking, GigMasters made it quite clear that it is the last day of sale and it is the only big sale of the year. • Along with the Columbus Day theme, even the timing of the Email was taken care of. Subscribers received the email on October 9 to remind them about Columbus Day and a last promotional email template was sent on 14th October, giving the subscribers last chance to shop. • An email that has close resemblance to an actual physical coupon. • Today, most of the people use coupons. Hence, digital coupons turn out to be an effective promotion tactic. • Single offer and direct CTA to create fewer distractions for subscribers. 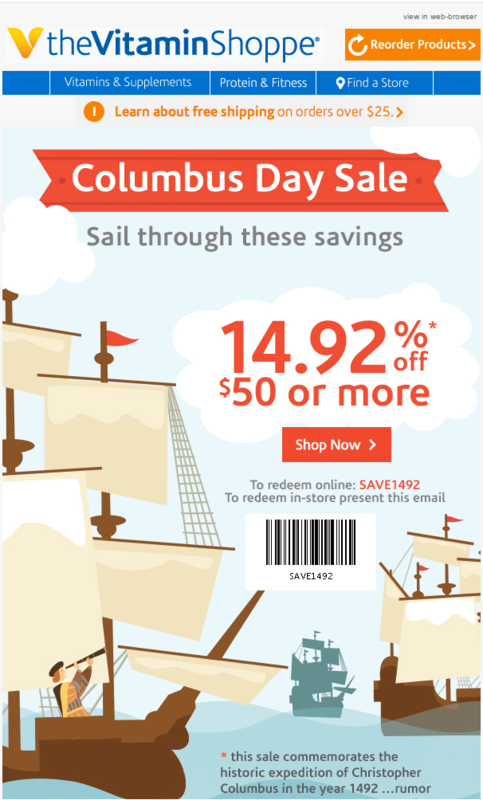 • Unlike others, didn’t use Columbus-themed image for the entire email body, but just the header to remind subscriber about the Columbus Day sale and all the details regarding the same. 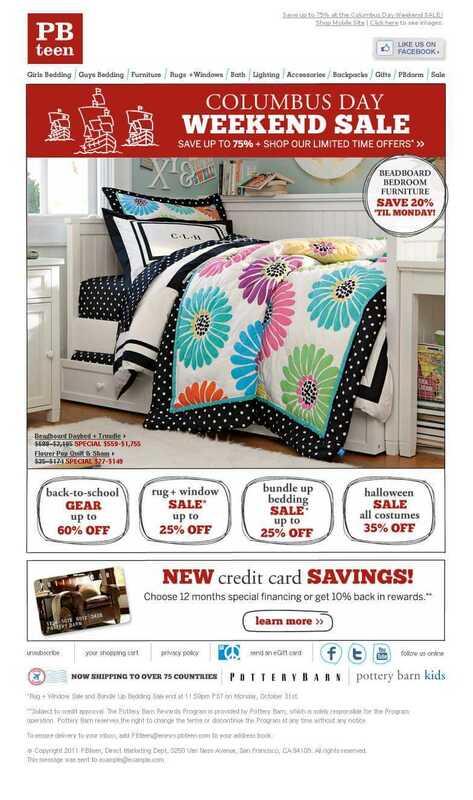 • Used image portraying the brand’s bedroom items and 20% off sale for those set of items. • To emphasize more on the holiday season, PBteen gave different sale offers for Halloween, Back-to-school, etc. 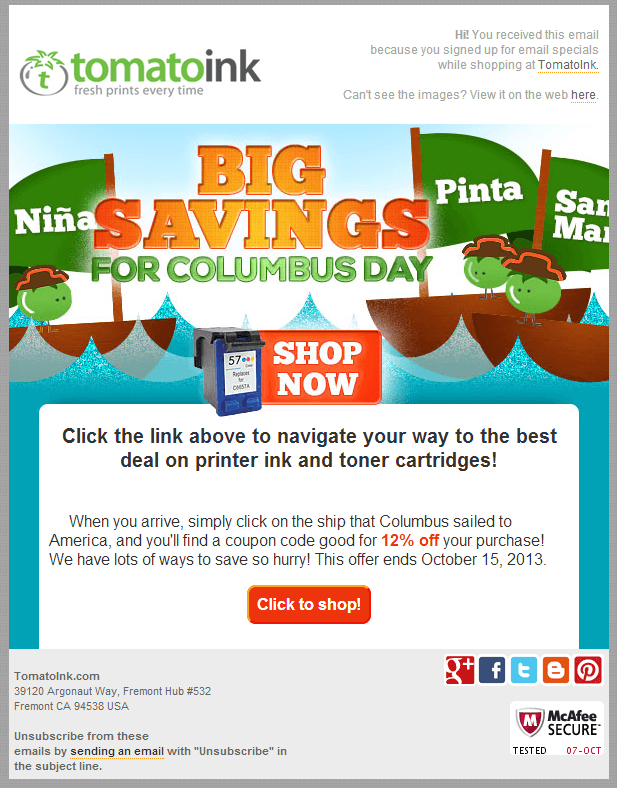 • Short and graphically rich email to announce the BIG SALE for Columbus Day. • Instead of using a simple image that resembles Columbus Day, the brand designed some animated images for the same. • Offered single offer of 12% off along with single CTA to shop under that offer. • Lastly, ended the email with all the social media buttons for more subscriber interactions. • The only long email in the whole list. • Used variety of images to represent all the offers introduced specially for the Columbus Day. • To earn extra points on shopping for top brands, gave CTAs to brands that are available on Sears and under which offer is available. • To know more about what the subscribers like the most, Sears displayed all the categories for the subscribers to choose from. With the message “We’ll bring it on”; it provides the subscribers the leverage of requesting for sale under the items they like. So, what are you waiting for? Take a deep breath and start with your 2018 Columbus Day Email campaign. Give your subscribers more reasons to love you. Get inspired and design something that will leave your subscribers spellbound. Monks offer you free Columbus Day design template which you can modify as per your brand requirements. Want the Monks to design and code it for you? Visit the Monastery where the Monks will offer you interactive email design and coding services for Columbus Day Email Templates.